Wolfram & Hart is a brilliant big bad. I think both Holz and Jasmine are very good big bads as well. I know most Whedon fans love Buffy, but I think Seasons 1.5 through 5 of Angel are fantastic. In the real world, the powerful, both goodies and baddies, are almost always obsessed with minutia. In terms of Harry Potter and LOTR, however, I would argue that the LOTR books shouldn't be judged by the same rubric as the Harry Potter books. In the LOTR books, Sauron is pure myth. He's just evil, and Tolkien doesn't much care about him one way or the other. Sauron's minions are altogether human and comprehensible (Saruman, various kings, Saruman's henchman), but Sauron himself is just the darkness behind the darkness, and Tolkien doesn't ever try to make him into something else. 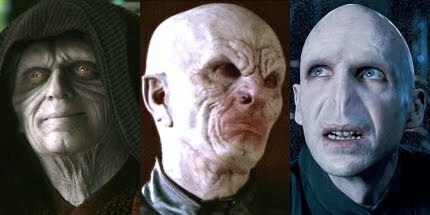 I think the Master in Buffy, Season 1, is the same. In both cases, the big bad is less important than the scoobies.